CCI is the company that manufactures CCI, Blazer, Blazer Brass, and Speer. They are owned by ATK (the same company that owns Federal). It’s all in the family! CCI’s Blazer Brass line is the brass cased line of ammo out of the CCI facility in Lewiston, Idaho. This ammo is boxer-primed and reloadable. 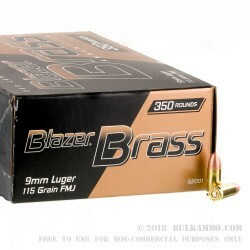 Blazer Brass rounds are very similar to the Speer Lawman ammo typically used for range training by law enforcement. 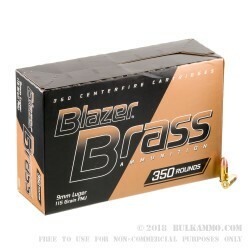 Blazer Brass offers economic ammo with high priced quality and reliability. All ammo is manufactured to SAAMI standards and backed by strict ISO certified quality systems. CCI primers are used to ensure reliable ignition and are loaded with clean burning propellants. These rounds are perfect for getting in that practice that you’ve been putting off! Grab some of these, fill up those ammo cans and head to the range! You’ll receive 350 rounds per box; 3 boxes per case. Used one 350rds box to break in my new G17 gen4 with no issues and gun wasn't very dirty when done. Shot 500 thru a new XD Mod2, no failures and all went bang. How can you beat it? 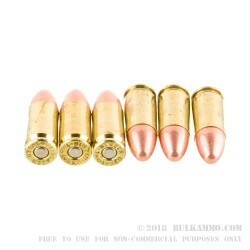 We bought the bulk 9mm Blazer Brass ammo from Bulk Ammo. The delivery was fast - only a few days. We have used about half of the rounds so far with no problems. Made in the US. Cheap and great quality. fantastic range ammo. Wish I had room for more! Boxed in nice slide out plastic trays. Excellant ammo for range practice! Got my ammo in 4 days! super fast shipping and packaged great! love blazer brass one of the first rounds i ever shoot. A: Hello Zachary, The Blazer Brass ammunition us loaded with a standard lead core and copper plated bullet. This round does not contain any steel. 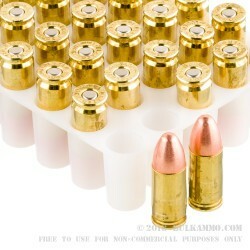 A: Hello Les, Blazer Brass ammunition is loaded into new brass cases. These cases will have no issues being reloaded.